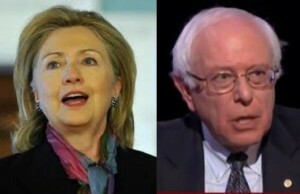 While blasting big media’s flame-throwing tactics along with Wall Street’s outsized influence on government, Senator Sanders stated that “the media has determined that Hillary is supposed to be the candidate.” If that is so, they do her no favors. Clinton has said nothing about running, yet a CNN panelist went so far as to accuse her of “sucking up all the air in the room.” Crossfire, and 90% of mainstream media, have manufactured a myopic frenzy that is not coming from the former Secretary. c) Barack Obama was actually the candidate of the “old guard” of the DNC (Kennedy, Kerry, Dodd, Leahy, Reid, Pelosi, Daschle, and Richardson), not her. Hillary was overtly and covertly told to sit down and shut up at every step of the primaries by these same operators. d) the media spent the first year of her campaign defining her as “inevitable,” gave double the (positive) coverage to Obama to elevate the importance of a first-term Senator with only two years tenure, and then bolstered the hope with their every news story that he would take her down. Doesn’t sound like the corporate-owned media (or Wall Street) wanted her to me. So what are they afraid of? Perhaps someone who is not so easily controlled? She had some great solutions to the mortgage crisis to keep people in their homes in 2008. Those solutions were not implemented. Per Matt Stoller of Salon, President Obama later oversaw the largest transfer of wealth from the middle class to the wealthy via their home equity. As to inevitability or entitlement, back in 2007, Hillary Clinton never showed up to any debate with the eight guys on the stage any less than thoroughly prepared. “Entitled” people are allergic to hard work and preparation. Since even Republicans who have long functioned as Hillary’s kryptonite have praised her knowledge and work ethic, the “sucking up all the air in the room” mantra isn’t cutting it. But this brings us to the sticky wicket of the superPAC, ReadyforHillary. Ms. Cupp’s panel was complaining of their newly released ad touting her. Clearly, ReadyforHillary must operate with Mrs. Clinton’s tacit approval. No matter how good their intentions, they may not be doing her any favors either by releasing ads about her so soon. I am a Hillary supporter, yet I, too, would rather we focus on the economy, the ACA, immigration reform and any number of other issues more pressing than an election 30 months away. Likewise, Hillary Clinton has urged the media and the American people to focus on the now — not 2016. Fans of hers who crave to move on from President Obama and install someone they feel will offer better and stronger leadership must be careful that they do not inadvertently play into the hands of those who would define her for their own purposes. While supporters who tout sites like Correct The Record are smart to highlight Mrs. Clinton accomplishments in an effort to be heard over prospective opponents or pundits who would smear her, the larger problem is media saturation. Any contenders for 2016 are at great risk for being ill-defined by a corporate media that all but demand control over election outcomes. But since they have been covering Hillary, and obsessed with her, for almost 25 years, the fair journalists out there have been quick to note she will likely get more scrutiny than most. Where Clinton is concerned, the media frenzy will continue, yet it is unlikely that they will be blamed for their daily distractions. That blame will fall on the shoulders of one woman — just as it did last time. Anyone under the impression that Politico, CNN, The New York Times, The New Yorker, MSNBC et al are mired in their preoccupation with her in order to help Hillary’s road to the White House is mistaken. The best course of action for any voter headed into 2016, be they Hillary Clinton fans or otherwise, would be to seek out the views and policies that come directly from the person(s) running. No filtering required. Anita Finlay is the author of Dirty Words on Clean Skin, an empowering journey that shares the truth of contemporary misogyny and tells it like it is for women who dare to lead. 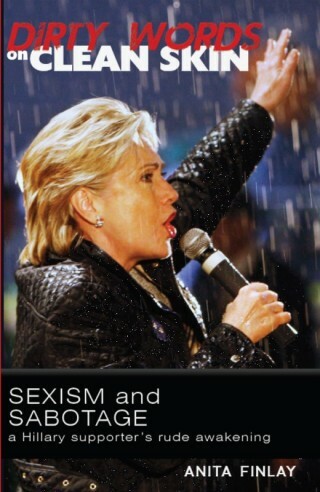 #1 on Amazon’s Women in Politics books for 16 weeks. Interesting that Sanders did not mention the current President as being in bed with Wall Street…. which he is . He is trying to thread the needle and not ding all that well at it, I’m afraid!